Naldz Graphics has a fun coffee break kind of post, which showcases more than 50 illustrations of cute monsters; adorable, fuzzy little monsters. I'm not a spaghetti cat or puppy video watcher; if I need something cute to look at, I'll choose monsters. Loved this post! 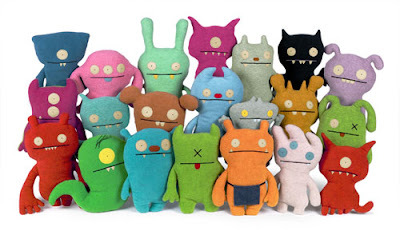 By the same vein, I'm also a fan of Ugly Dolls (see picture). Of course, some of the art reminded me of Twitter's FailWhale, which just made me think that I must be completely obsessed with Twitter... Oh, and while we're on the subject, if you're on Twitter, I'm @spydergrrl.